Employee productivity is frequently related to profitability. When you think of profitability, several factors probably come to mind. Included are labor, overhead and production costs. However, If you aren’t factoring in employee productivity, you’re missing a key metric. According to Gallup, employee productivity is the basis for human development and economic growth. Poor employee productivity actually stunts both economic and community growth. This means that employee productivity is not just an important factor for the success of your business. It is also important for success of the community environment, too. According to Gallup, one of the deciding factors for whether employees are productive is if they feel that someone at work encourages their development. It is also a determining factor for your company’s culture. How culture and leadership impact employee productivity. Your company’s culture plays a significant role in employee productivity and engagement. Only 15 percent of employees are engaged worldwide, states Leadership Training Strategies to Improve a Broken Workplace. In the U.S., 30 percent of U.S. workers are engaged. While this number is better than the global outlook, it still leaves around 70 percent of U.S. workers who are not engaged in the workplace. This points, to both engagement and talent retention issues that diminish profitability. Engagement and retention strategies are important because recruitment strategies such as pay, benefits and perks only go so far. At some point, employees want to believe that the work that they are doing is important. Their direct superiors emphasize this importance by training and developing them. Leaders also play a key role in determining if these employees are engaged and are loyal to the company. 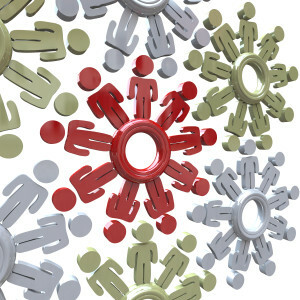 Therefore, how do you know if culture behavior supports supervisors, employees, employee productivity and profitability? Identify culture behavior and employee productivity problems. Where do you start when identifying behavioral problems that impact employee productivity in an organization? Guessing certainly isn’t the answer. All too often, guessing results in training and development that fall short or are off target. The result is no return on investment and wasted time and effort because employee productivity does not improve. Ignoring the root cause problem is also unproductive. For example, engagement and retention are symptoms, not the root cause for why employees are disengaged or don’t want to stick aground. Based on TIGERS® research and over 25 years of experience unraveling the behavior dynamics of poorly performing groups, the root cause could be one of six principles required for high performance productivity. Those principles are trust, interdependence, genuineness, empathy, risk resolution and success along with behaviors that support them. 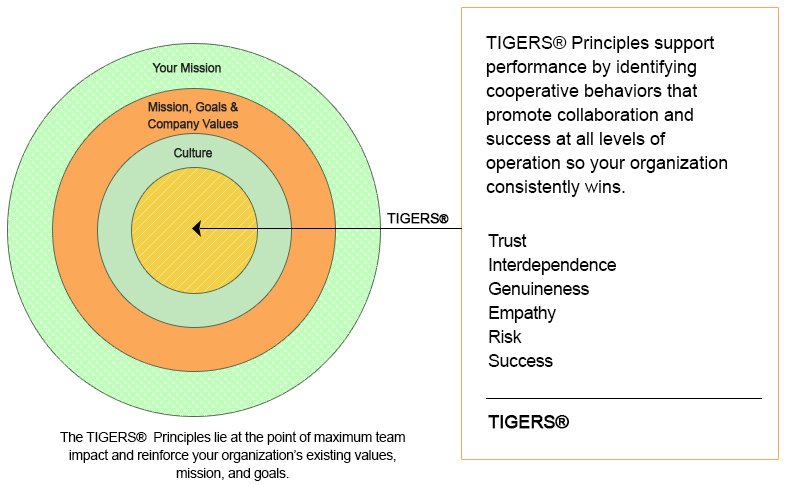 These six principles form the acronym, TIGERS®. Leadership training may not be the solution either. If codes of conduct and behaviors that support group norms that apply to everyone have not been reasoned through and put in place, no amount of leadership training can transform a leader’s behavior unless that leader unequivocally decides to improve. Assess the TIGERS® six principles to isolate employee productivity issues. 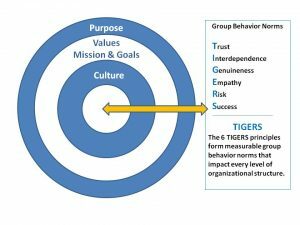 TIGERS® approach to helping leaders identify root cause culture behavior that impacts employee productivity is a 360 assessment that identifies the quality of trust, interdependence, genuineness, empathy, risk resolution and success in the company-wide culture and departments. And, it is also known that a one-time events designed to improve culture behavior are a waste of time, money and energy. Facilitated decision making by leaders that helps departments and employees identify and formalize expected group norms of behavior that apply to everyone. For this reason the TIGERS Team Behavior Profile™ takes a three assessment in one approach. This approach gives leader a baseline assessment and two comparison assessments so employee productivity improvements can be tracked over time. This ensures that return on investment and further development refinements can be measured. Training that improves employee productivity. Ideally, leadership training comes before an employee is elevated to supervisory or management roles. Training helps leaders prove that their behavior skills meet group norm expectations. It also helps leaders develop their technical skills, too. Why is this important? Employees quit poorly trained bosses, not necessarily organizations. If leaders aren’t properly trained to lead, their employees will respond through disengagement, low employee productivity and potential job hopping. The TIGERS Manager as Facilitator Training™ offers leaders both culture behavior improvement techniques and group facilitation skills. The combination of attitude techniques plus skill development drive measurable results. Leaders, who skillfully facilitate employee groups to solve complex department and company problems, create a framework for project management, complex problem solving, and for launching innovations. Leadership training like this teaches leaders how to improve cooperation among employees and departments for high performance results. When tied to organizational initiatives, good facilitation can result in annual cost savings or long-term improvements in productivity. As a result, groups are able to accomplish more with high levels of employee commitment and accountability. Break the status quo to improve employee productivity. Starting with reflection and end with commitments. It can be difficult to reflect on your business during the daily grind. A retreat offers valuable time to reflect on what is and plan for what is possible. Connecting with other departments/teams. It can be easy for employees to stay within their own departments. Cross-functional retreats build greater interdepartmental understanding and erode silos. Allowing for flexibility. When planning your retreat, build in spontaneity. Breakthroughs can happen during scheduled events. They can also happen when you allow communicating between people to happen naturally. Employee productivity is one of the most overlooked aspects of company profitability. It is also a key metric in global economics. Poor employee productivity can stunt both economic and community growth. Direct supervisors play an essential role in employee productivity. Leaders can implement training strategies to improve their own performances. Learning how to correctly facilitate groups of employees for solving complex company problems improves employee productivity in measurable ways. This can be accomplished in retreats. By focusing on team culture and employee productivity, leaders help improve company and employee success. Care to dig deeper into employee productivity?